The vast majority of Canadian executives believe sexual harassment is not a problem at their companies, the latest quarterly C-Suite survey results show, marking a strong contrast with the relevant data. Just five per cent of the 153 senior managers interviewed for the survey released Monday agreed that sexual harassment is a problem at their company. 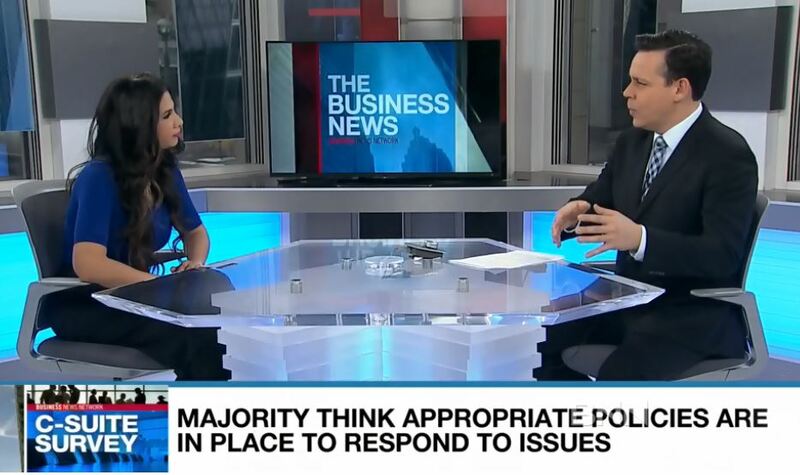 While a larger proportion of respondents — 35 per cent — agreed that sexual harassment is a problem for their industry or sector more broadly, most executives still disagreed. Interviews for the survey were conducted via telephone between Nov. 11 and Dec. 6. The 49th edition of the quarterly survey focused on sexual harassment in the workplace as a growing number of major public figures face allegations of sexual misconduct. Executives at larger companies were more likely to admit to having witnessed or heard about sexual harassment in their workplace. Sixty per cent of respondents in leadership positions at companies with at least 1,000 employees said they had witnessed or heard about sexual harassment at their companies, but that figure gets cut in half — to 31 per cent — when all responses are included. When forced to choose, most respondents (52 per cent) said sexual harassment was infrequent and rare at their own companies versus 30 per cent who described it as common and frequent. The data tells a very different story. Half of all women working in Canada have experienced sexual harassment at some point over the course of their careers, according to an Insights West pollreleased in early December. Last month, the federal government released a more detailed study that found 30 per cent of all Canadians have experienced some type of sexual harassment in the workplace, with 12 per cent noting those incidents have occurred within the last two years. According to the C-Suite Survey results, however, more than two-thirds of Canadian executives (69 per cent) believe sexual harassment in Canadian business is less of a problem than it was 15 years ago. That compares to 22 per cent of executives who said it was more of a problem today. The latest data available from Statistics Canada, which tracks sexual assault but not sexual harassment, nonetheless noted the rate of incidents has been largely unchanged over past decade even as declines were noted over the same time period for all other types of violent and non-violent crime. Sheikh argues that because of their leadership positions, respondents to the C-Suite survey effectively had no choice but to be guarded in their answers. Virtually all executives who participated in the survey — 93 per cent — said their company has a culture that helps prevent sexual harassment.